Interior Design Ideas For Your Home Bedroom Furniture Children’s Bunk Beds With Storage: How To Choose? Bedroom is a very special place for any person, and kids aren’t any different. Whether it’s to play, have fun, or relax after a day at school, a bedroom is a sanctuary where everything should be in balance and harmony. For kids another thing is also important – functionality. When choosing a bed for children’s room there’s a variety of beds to choose from: beds that look like cars, helicopters and pirate ships; kid’s bunk beds with desk underneath; double or single beds. You should also think about free space in a kid’s room and some storage solutions for everything to fit. It appears that bunk beds with desk and storage for children’s rooms are one of the best options you have to create a truly comfortable environment for the child. While there’s an abundance of novelty beds https://www.furnitureinfashion.net/Blog/6-most-popular-designs-of-childrens-novelty-beds/ that come in all shapes and sizes, you should really think about the space you have and how to use it best. Bunk beds with desk and stairs usually have more storage as they are suited for the needs of children and their hoards of toys. When you have everything as one furniture unit it’s more comfortable and functional. But on the other hand you need to carefully consider the size of the room and the heights of your kids so they can easily use the furniture and be comfortable with it. After all it’s not all about design and beauty, but about comfort as well. Another important thing to consider when buying a children’s bed is a kind of mattress to choose. While some bunk beds have some kind of mattress included in the deal, there are others that go without it, which leaves you with a choice to buy a mattress that best suits your kid’s sleeping habits. You can go for an innerspring mattress that has good support of the back, or choose a foam one. bunk bunk beds can be more durable, safe and live a longer life. Depending on the material used, bunk beds can be more durable, safe and live a longer life. Most of modern kid’s bunk beds with desk are made of either metal, or wood. Both materials have their advantages and drawbacks. While metal beds can get squeaky after some time, they are lighter. Bunk beds made of wood are heavier, are more prone to damage, but come in a great variety of designs and colors. 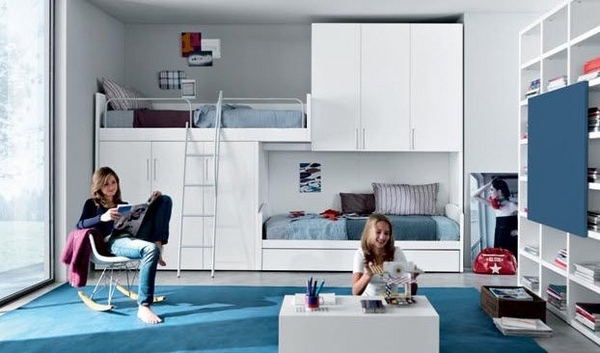 Modern bunk beds come with all sorts of cool stuff – stairs, futons, there are even bunk beds with desk underneath. This is a great advantage because you are basically looking for one piece of furniture that includes many more. 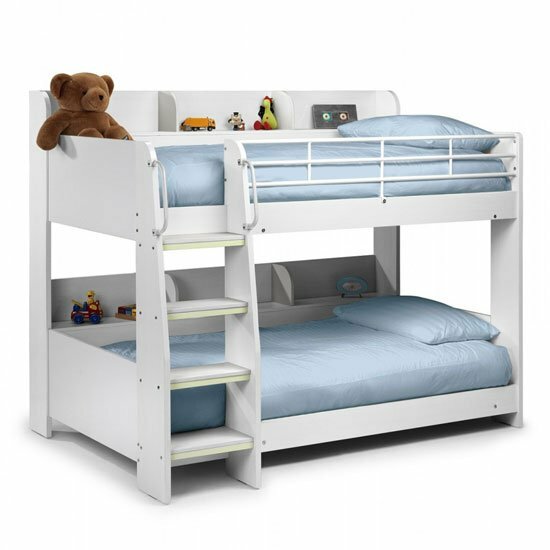 Not only is it multi-functional, but you also save a lot of money as instead of buying a separate bed, a desk and some storage drawer, you can go for one bunk bed with desk and storage that will accommodate two kids and serve all their needs.